WILMINGTON, Del. (CNS) — A manger scene can make people feel good at Christmas and that’s what Patty Derrick and her friends in Rehoboth Beach were aiming for when they spoke to town leaders about erecting a creche that has been part of the beach town for about a half-century. On Dec. 5, volunteers from St. Edmond’s erected a creche belonging to the local Kiwanis Club in the town square about 50 feet from the city’s Christmas tree at the bandstand in the center of town. The club has put the creche up in town every year for at least 50 years, according Derrick, including for many years in the same location in the downtown square. 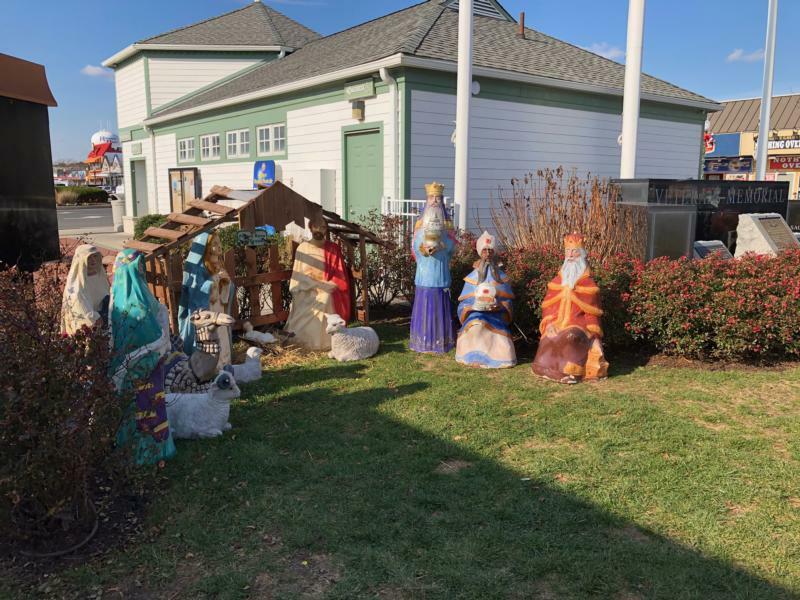 Last year and for several years previous, the creche had been displayed adjacent to a nearby bank while part of the town underwent a facelift during construction, she told The Dialog, newspaper of the Diocese of Wilmington. This year, volunteers wanted to return it to its original location. Derrick said she was asked by the pastor at St. Edmond’s, Father William Cocco, to contact Mayor Paul Kuhns for permission to put up the creche near the Christmas tree. She said she reached out to the mayor and later bumped into him while she and Father Cocco attended an event in town. Derrick said the mayor had no problem with the creche being put up and said they should speak with the town manager, Sharon Lynn. Derrick said they approached Lynn at the same event and she expressed no opposition to the manger scene going up at that location. She said Lynn asked them if they would reach out to other denominations to see if they wanted to erect other holiday symbols. Derrick said she made the outreach and volunteers proceeded with plans to put the creche up at the town bandstand. So the creche went up — and came down the next day. Derrick said someone at Lynn’s office called the parish in the morning and said if the manger scene wasn’t down by noon, the town would dismantle it. Johnson went on to say the town had asked the volunteers to approach different religious denominations about including other displays. “It was communicated by the city for others to be contacted,” Johnson said. She said the town received complaints about the creche after it was erected. She also said the issue could be included on the agenda of the next meeting of the town commission Dec. 21. Kuhns said in an interview that he has set aside a place on the agenda to address the issue. “They can send a message to religious minorities that they do not have a place in government,” Kuhns read from the letter. In a later interview with The Dialog, Kuhns described the ADL letter as “just an outside point of view. It is a legal opinion that I’ve considered.” He said town employees and elected officials have been subjected to disparaging remarks by way of telephone calls and emails since the creche was removed. Kuhns says he’d be happy to see a creche erected on private property, but he does not expect a resolution to be reached this year on an effort to put up a display on public property. He believes an association of local religious groups should develop a plan to present an all-inclusive proposal sometime next year. Father Cocco said he welcomes other religious groups to participate. Father Cocco said that he wishes the issue had been handled differently. Owens is editor of The Dialog, newspaper of the Diocese of Wilmington. It’s a terrific article about an issue that surfices each year at this time. What to do about the crèche on public land.The holiday evolved from the holyday. Old St. Nike too should be banished from our public land. Santa ( saint, sanctus ,meaning holy) Claus a derivative from NichLAUS. He began his ministry in the 4th century, Bishop Nichlaus of Cusa outstanding for his care of the poor children of his diocese. Can you identify other “holiday” customs that point back to Christ? We better be careful or we’ll lose them for their richness. PS In the interest of full disclosure the columnist is my baby brother and a long time newspaper editor.